Beginning in the 1800’s, Door County lighthouses safely guided sailors as they made their way through the lakes. Although most of the beacons have long since retired, they still stand as symbols of strength and protection along Door County’s shores. A visit to this peninsula is nearly incomplete without seeing the lighthouses! As you plan your vacation, be sure to make time for a visit to these fascinating local treasures. Discover the Door County lighthouses and more famous attractions in our free downloadable Vacation Guide! It’s filled to the brim with great recommendations for things to do during your Door County getaway that you won’t want to miss! The Cana Island Lighthouse is the peninsula’s most iconic and photographed lighthouse. It was established in 1869 and served the peninsula’s coast for many years. Today, it’s recognized as a part of the Door County Maritime Museum and is open for tours. You may even choose to climb the 97 step spiral staircase to the lighthouse’s gallery deck. There, you will be greeted with stunning views of Lake Michigan! Many visitors and locals know this historic treasure as the “Birdcage Lighthouse.” It earned its name from the lantern room’s strange birdcage-like design. The lighthouse was erected on an island near Baileys Harbor in 1852 and served a short 17-year term until it was removed from service in 1869. Although the lighthouse is privately owned and cannot be visited by the public, many boats sail by just to catch a glimpse of its unique structure. The gap between the peninsula’s tip and Washington Island earned the name “Death’s Door” due to its dangerous waters. To help save lives, the Plum Island Lighthouse was erected in 1896. Visitors traveling aboard the Washington Island ferry will see the range light tower, keeper’s dwelling, and fog signal building. The front range light can only be seen by boats approaching Death’s Door from Lake Michigan. This impressive eye-catching structure is nearly impossible to miss from both land and sea. Its brilliant red color has made it a sight to behold since its construction in 1882. Today, it is found on the fully operational U.S. Coast Guard Station at Lake Michigan. Visitors are not permitted into the tower, but you are more than welcome to explore the lower level break wall. For a more in-depth and informational experience, we highly recommend joining a tour that will take you to Door County’s most treasured lighthouses. Knowledgeable guides will also be available to answer your questions and share everything they know about the historic landmarks. Old Time Trolley Lighthouse Tour: Experience the Door County lighthouses tucked away in hidden bays and coves. This tour includes a visit to Cana Island Lighthouse and the Canal Station Lighthouse. This summer, you won’t want to miss the annual celebration of the peninsula’s 11 beautiful lighthouses! 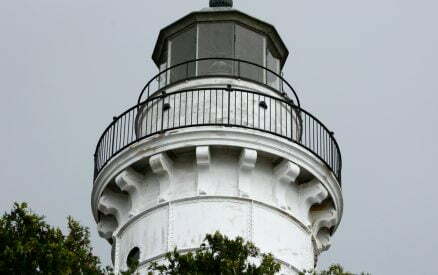 The Door County Lighthouse Festival offers guests a guided or self-guided tour of all 11 lighthouses, including those usually restricted to visitors. It’s a once-in-a-lifetime opportunity you must add to your summer to-do list. Bid adieu to the typical hotel experience and say hello to The Ashbrooke! Our romantic adults-only hotel provides everything you need for a relaxing and memorable stay. From cozy rooms and suites to luxury amenities, you’ll feel like royalty as soon as you walk through the door until the moment you check-out. Ready for the vacation of a lifetime? Book your favorite room at The Ashbrooke for the 2017 season today! We can’t wait to welcome you soon!